Mighty Bright is proud to introduce the Encore Light, a smaller version of the popular Orchestra Light. 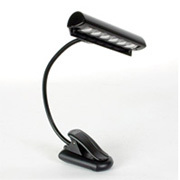 Features include 6 bright white energy-efficient LEDs in a row, each lasting up to 100,000 hours; a switch that allows you to choose between two brightness levels; precisely engineered optical grade lenses that spread light evenly; a flexible gooseneck; a padded clip that opens extra wide; and a durable travel bag. The light runs on three AAA batteries and an AC adapter, both included.